Here are some simple interview strategies you can adopt in your next job search to ensure you are selling yourself effectively to employers, at interview and in your resume as well. A very effective and persuasive tactic when selling something is to promote its benefits as well as its features. Very simply, features are what something has; benefits are what those features do for you. For example, if you're selling your used Oldsmobile, one of the features you might mention is its large trunk. If you focus only on the feature, you'll say, "This car has a large trunk." (Yawn) But if you promote that feature with its benefit, you could say, "The trunk is huge. You can get three suitcases and your golf bag in there for a trip to Disneyland and still have plenty of room for all the souvenirs you'll want to bring home!" See how that makes a more powerful impression? The potential buyer can visualize how this car with its large trunk can make packing for his next trip much easier. Use the same tactic for each feature of the car, and (Ka-ching!) you have a much quicker sale. When you're preparing your resume or answering questions during an interview, you're selling yourself, so use that same tactic: sell your benefits along with your features! 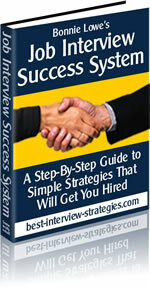 You have to use these interview strategies if you are going to succeed. 2004 Administrator of the Year, Acme International Inc.
Those are pretty impressive. Now let's see how you can turn those "features" into "benefits:"
Feature: 10 Years of Experience. Benefits: "I know what to expect in this type of position; I've handled this type of work before; I won't need much training or supervision; I'll hit the ground running and will start producing right away." Feature: Ability to Type 90 Words Per Minute. Benefits: "I can get your 10-page reports done in less than an hour; I will speed up your work flow." Benefits: "I'll keep track of your schedule so you'll always be on time and have the materials you need; I will be able to quickly retrieve any document; I will prioritize my workload to ensure the most critical projects are done first; I will save you time; I'll help you make your boss happy." Benefits: "I will support the company's overall mission and do whatever I can to help achieve it; I won't complain about hard work or long hours; I will faithfully do my job to the best of my ability." Benefits: "I will easily be able to give you and your staff the information you and they need, whether in verbal or written form; I will be able to compose much of your correspondence, relieving you of that duty; I will save you time and effort." See how that works? A "feature" is nice. But even better is answering the hiring manager's unspoken question, "So why is that important?" You do that by selling your benefits. Make a list of your own features and their corresponding benefits. Learn to promote these benefits to your potential employer. Do this in your cover letter, your resume, and during your interview to make a powerful impression. You will SELL yourself into a new job!